Odwa Ndungane is a South Africa and Sharks wing who made his Test debut against Italy in a 26-0 victory in Cape Town in 2008. He earned a call-up to the Springboks squad a year later to play the British & Irish Lions and he started the final Test in Johannesburg, which the Lions won but the Springboks took the series 2-1. Odwa pushed on for the Sharks and stayed on the fringes of the Boks side. 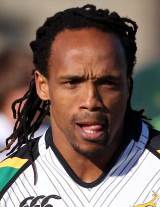 And he will hope for more match action in the green and gold of South Africa in the 2011 World Cup.